*The color of the comb or clip is different depending on the flower. *Since this is a hand-made product, the shape and design might be slightly different from the picture. the temperature and humidity of where it is stored, but can be fixed using additional adhesives or a glue gun. Green Large Spider Lily Hair Clip 6"
Mauve Large Spider Lily Hair Clip 6"
Pink Large Spider Lily Hair Clip 6"
White Large Spider Lily Hair Clip 6"
Green Small Spider Lily Hair Clip 4.5"
Pink Small Spider Lily Hair Clip 4.5"
White Small Spider Lily Hair Clip 4.5"
Mauve Small Spider Lily Hair Clip 4.5"
Yellow Spider Lily Hair Clip 4"x 4.5"
Dark Purple Spider Lily Hair Clip 4"x 4.5"
White Spider Lily Hair Clip 4"x 4.5"
Red Spider Lily Hair Clip 4"x 4.5"
Orange Bird of Paradise Hair Clip 5"x 5.5"
Purchased Item: Gradation Orange Large Spider Lily Hair Clip 6"
Exactly what I wanted, the quality is excellent. Purchased Item: Red Plumeria Clip 4"
I have bought two of these plus the lei that matches. Arrived in a very timely manner and they are just what I needed! Purchased Item: White Kahili Ginger Hair Clip x 3.5"
This ginger hair clip is the perfect size for many different hair styles up or down. 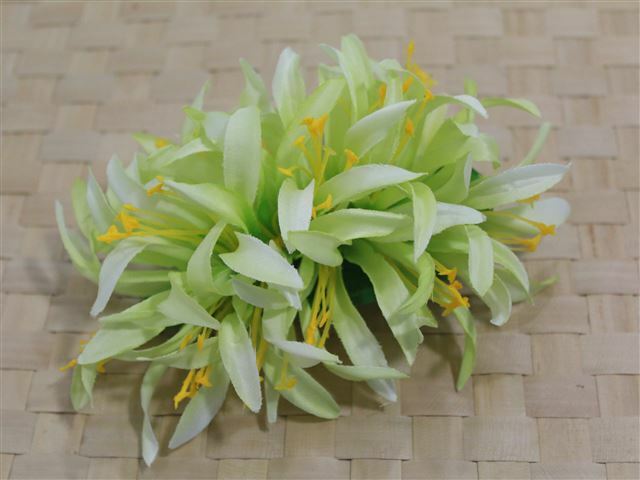 Purchased Item: Orange Deluxe Hibiscus Hair Clip 5"
So sweet. Everyone ask where I got it.